If you’re considering getting a hamster or purchased a young one that’s still growing, you may be wondering: “how big do hamsters get?” As you’ll soon see, all hamsters stay small enough to earn the title of being pocket pets, but there’s still a nice variety of sizes to choose from. Adult hamsters can grow to be anywhere from 2 to 14 inches (50 to 355 millimeters) in length, and from 0.9 to 16.2 ounces (25 to 459 grams) in weight. The maximum length and weight of a hamster depend greatly on the breed and a few other factors we’ll discuss in this post. 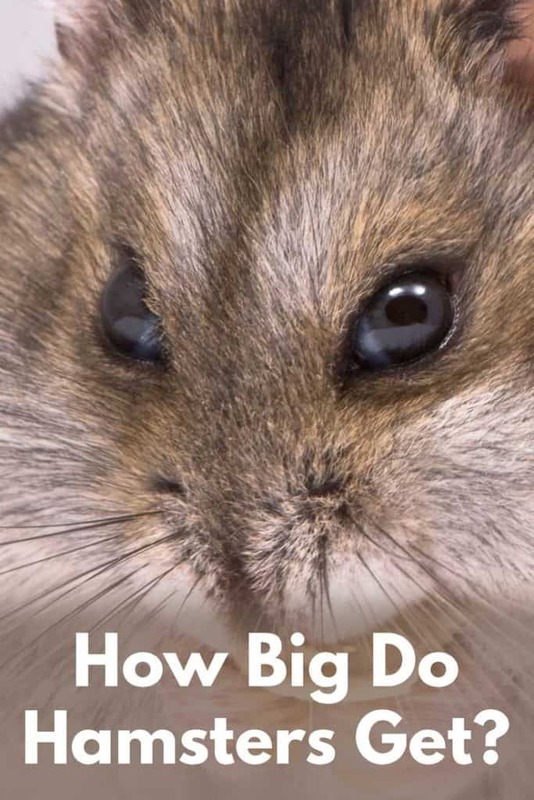 Keep reading to find out more about how big the different breeds of hamsters can get, and to find out some things that determine the size of an individual hamster. What Determines a Hamster’s Size? Before we jump into the sizes of different breeds of hamster, let’s quickly look at the four factors that determine how big a hamster will get. This is the biggest determining factor. Each breed of hamster has a set range that each hamster will fall into, with few exceptions. As you’ll see, many of these ranges are rather large considering the small size of these rodents, so there are a variety of sizes within each breed. Male hamsters are generally larger than females, though this isn’t the case with all individual hamsters. It’s the same as it is with humans. Men are generally taller than women, but there are women that are taller than some men. 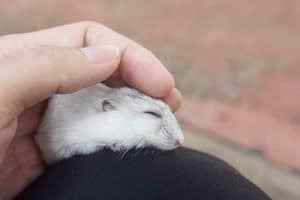 Although genetics plays a smaller role in the size of a hamster than their overall breed, this is something that could determine where your hamster falls within the range of their species. If two larger hamsters are bred together, they’ll have larger babies compared to two smaller hamsters that are bred together. This is by far the smallest determining factor in hamster size, but it can affect it. If a hamster has a small litter, those babies will typically be larger than the babies of a larger litter. This is because in smaller litters, each baby has more opportunities for nourishment compared to a large litter. We’re going to take a quick look at all 18 species of hamsters found throughout the world and discuss their sizes. 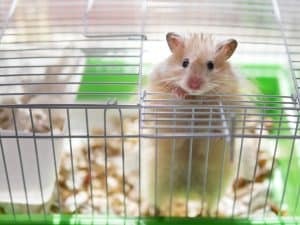 Despite this long list of hamster breeds, only five are typically kept as pets: Chinese hamsters, Campbell’s Russian hamsters, Winter White hamsters, Roborovski hamsters, and Syrian hamsters. The largest of the hamsters kept as pets, there are a wide variety of Syrian hamsters to choose from. They may also be known as golden hamsters or teddy bear hamsters. Something interesting to note is that despite the larger size of this breed, they may also have the smallest adult hamster, named PeeWee. The smallest breed of hamster in the world is the Roborovski hamster, these are also one of the five that are kept as pets. Because of their small size, special considerations must be made when choosing a cage for them since they can fit through smaller spaces than their larger cousins. Also referred to simply as Campbell’s or Russian hamsters, this is another species of hamster that are kept as pets, but they can also be found in the wild in Mongolia, China, Russia, and Kazakhstan. Something interesting about this species is those wild hamsters are rarely longer than 3 inches (80 millimeters) because in captivity, they have better access to nutrition. Closely related to Campbell’s hamster is the Winter White Russian Hamster. These also go by Djungarian hamster, striped dwarf hamster, or Siberian dwarf hamster. Despite their name, only wild hamsters become white, and only in the winter. In captivity, they can be hard to distinguish from Campbell’s hamsters. 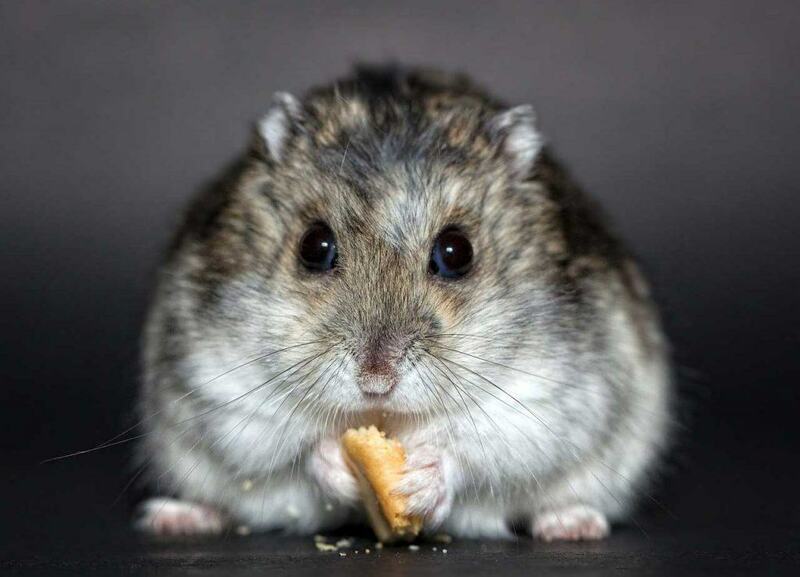 The Chinese hamster is one of the most popular species of pet hamster available today, and they can also be found in some laboratory settings, plus are still well-established in the wild in China. As you may have guessed by their small size, these are considered a dwarf breed of hamster. What sets them apart from other hamsters is that their tail is long compared to other hamsters. More commonly known as the dwarf grey hamster or the migratory hamster, these guys can be found in the wild throughout parts of Europe and Asia. Their small size has earned the Armenian hamster a place among the dwarf hamsters, although they’re on the large size compared to other dwarf types. Despite the similarity in name, this is a completely different species as the Chinese hamster. Chinese Striped hamsters live exclusively in the wild and are not kept as pets. As you may have already guessed by their size, these guys are considered dwarf hamsters as well. They also have a longer tail than other types of hamster. Found only in parts of the country of Georgia and Russia, the Ciscaucasian hamster is also referred to as the Georgian hamster. Because of their large size, these hamsters are sometimes hunted for their furs, but they reproduce so quickly they’re in no danger of over-hunting. 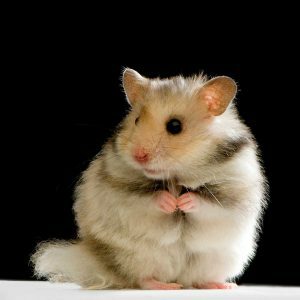 The largest of all species of hamster, it should be no surprise that the European hamster is found primarily in Europe. It’s also known as the black-bellied hamster. Unfortunately for these big guys, they are endangered in some countries because they’re considered pests for farmers, and are hunted for their fur. Not much information is available about Eversmann’s hamster. What we do know is that it was named after Russian biologist and explorer Alexander Eduard Friedrich Eversmann. Despite being considered a pest by most of the people this hamster interacts with in the wild, it’s still considered of least concern to conservationists. Also known as the Tibetan hamsters, the Ladak hamster is native to Tibet, China, Nepal, and India. It lives far above sea level in the Himalayan mountains. These hamsters are considered dwarfs despite being slightly larger than some of the other species of dwarf hamster. Also known as the long-tailed dwarf hamster, these little guys have tails that are about a third of the length of their body, which is proportionally longer than most species of hamster. The lesser long-tailed hamster can be found in the wild in parts of Russia, China, Mongolia, and Kazakhstan. Another species for which there is little information, the Mongolian hamster is a close relative of Eversmann’s hamster. It can be found in Mongolia as well as parts of China. These hamsters are alive and well throughout their territory and are in no danger of being wiped out any time soon, despite being a nuisance to farmers. Although it was reported that several Gansu hamsters were captured from the wild in the 20th century, they never made it to be pets today. Something that sets this species apart from other hamsters is the length of their tails. Their tails are nearly the full length of their bodies, far longer proportionally than any other hamster species. Known for being a pest for thousands of years, the greater long-tailed hamster may also be referred to as the Korean hamster because it’s native to parts of Korea as well as China. As you likely guessed by their name, this is another species of hamster that have longer tails compared to other species on this list. Also known as the Dobrudja hamster, the Romanian hamster is found primarily in Romania as well as Bulgaria. While these hamsters have similar color patterns as many of the dwarf breeds, they’re larger and therefore not among the dwarf breeds. These hamsters can only be found in parts of China and are also known as the Kam dwarf hamster. Despite their limited range, they’re not in any danger of extinction. These dwarf hamsters are another species of hamster that have tails that are proportionally longer than most species. Their tails can be nearly half the length of their bodies. The Turkish hamster is closely-related to the Syrian hamster and is also referred to as Brandt’s hamster or Azerbaijani hamster. It has been kept by some as pets but rarely. They have the most widespread territory of all wild hamsters, yet are the most at-risk because they’re considered pests by the farmers where they live. Hopefully, your question of “how big do hamsters get?” has been answered. As you can see, both wild and pet hamsters come in a wide variety of sizes so you can be sure to find one that’s perfect for you. To learn more about how to take care of hamsters, be sure to check out the rest of our blog. We have tons of posts to answer all of your hamster-related questions, including on how big of a cage you need for your hamster.